The street façade of this building suggests a very modest meeting space, but the cross-gabled, cruciform footprint provides a substantial and charming large main hall at the rear, facing east. The focus of the front is a welcoming gabled entry, prominently featuring FRIENDS MEETING HOUSE 1913 over the recessed porch. The entry wing is flanked by rooms on each side, under a gabled roof with side-facing gables. Since the beginning, the building has incorporated a caretaker’s suite. The eclectic style includes Arts & Crafts details, such as shingled roof, stucco and half-timbering, exposed beam-ends, double drop-siding and diamond-paned windows. The hall is simplicity itself, with wood wainscoting and fir floors, and with no decoration and no hierarchy of seating. The Quaker movement has always favoured simplicity of design and local independence: The design of meeting houses, since the mid-17th Century, has reflected local tastes and prosperity, with no two buildings alike, and ranging from Homestead to Greek Revival. Designer Henry Clark was a civil engineer and a member of the Friends, and also designed bridges in Japan. He is said to have later returned to practise in his native Buckinghamshire, England. Alex Ingram was a carpenter who lived on Lewis St in James Bay. The Religious Society of Friends, known as the “Quakers,” was active in Victoria from 1907, meeting in various locations in the city. In 1909, a fund-raising committee was estabished for the purpose of building a meeting house. A large, double-length, property was found on Fern St and purchased for $3000. Raising further funds for the building was difficult, at a time when the economy was in a slump, but help came from a British member Arthur Dann who sent $428, with a promise of more to come. The building went ahead at a cost of $4,250, partly mortgaged. The official opening took place in 1913. This, the first purpose-built Friends meeting house in BC, is also the oldest meeting house in continuous use and it resembles many of the private homes in the area, surrounded with mature Garry oak trees, and fits comfortably within this residential context. The Friends now lease their substantial “backyard” to the City as a park. 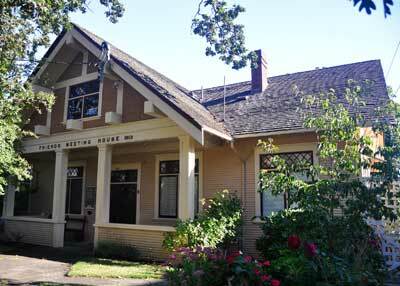 The building originally included a reading room, office and caretaker’s residence, in addition to the 25’ by 35’ hall. More meeting space was later developed in the attic, so that children could be looked after while their parents were attending the meeting in the hall. The Friends held a 75th anniversary celebration in 1988 and a commemorative tree was planted. A history of the Religious Society of Friends in Victoria was published that year. The Meeting House received heritage designation in 1990.